Before you rush out and buy a bunch of pricey Philips Hue bulbs to start your smart lighting setup, we’ve got another option you should definitely consider. The MagicLight WiFi Smart Light Bulb is just as good as Philips Hue’s $50 multicolor bulb, but it only costs $17. 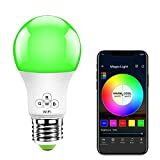 For that price you get a great smart light that supports 16 million colors, app control, Alexa and Google Assistant, and plenty more! ✔ Application: This is a WiFi enabled light bulb, no hub required. Multiple lighting patterns, suitable for a showcase, residential, office, hotel, shop, exhibition room, landscaping, indoor, home etc.